I have been playing World of Warcraft for over 20 months, spending an average of 20 hours a week in-game. I mostly play on a server which emphasizes role-playing (RP) and completing in-game tasks rather than player-vs.-player (PvP) combat. What this means is that the way people talk is often not as abbreviated as it is in the stereotypical “leet speak” shorthand (e.g., cu l8er) and more like how one would see dialog written in a novel. I also play characters that belong to the Horde, the underdog faction, and I’ve found that a lot of Horde players enjoy complaining about how the Alliance is everywhere and have an unfair advantage. For the past 6 months I have been part of a high-end raid group. This raid consists of 40 characters joining together each week to delve into an end-game dungeon called Molten Core and defeat the monsters therein. Molten Core has several big “boss” monsters with names like Garr and Majordomo Executus and many more generic monsters like Lava Annihilators and Core Hounds. Each type of monster and boss has different abilities and does different things when a raid fights them. 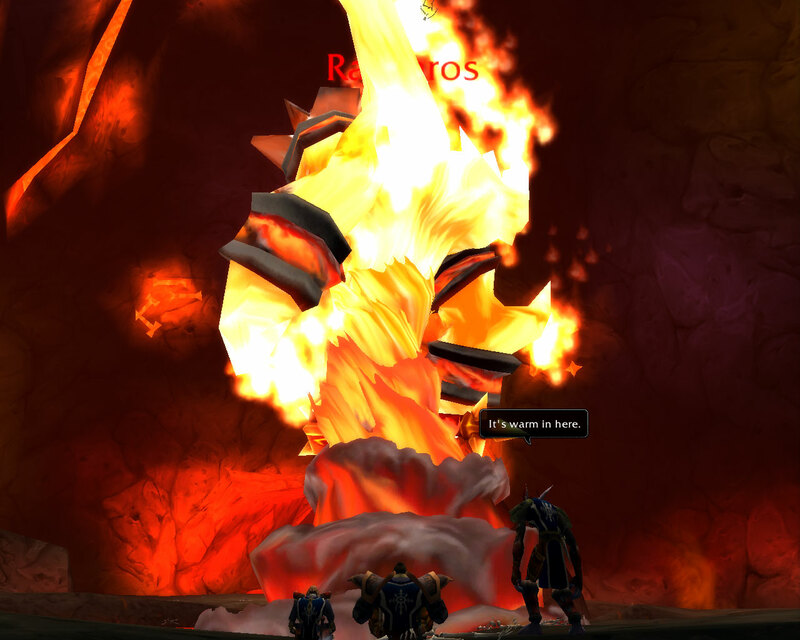 Every week, we were able to get a little further in our attempt to finish the dungeon, and after several months, we defeated the last boss, Ragnaros. Over half a year, the membership of this raid group has fluctuated. We have a core of about 20 players who show up every week since the formation of the group, another pool of 30 or 40 who were regulars for 2 or 3 months, and another 20 or so who showed up either just once or sporadically. I do not know any of these players in “real” life. For most of them, I also don’t know their ages, their nationality, their location, or any other real life demographic. Some of this information, however, I do know from being able to hear them when they talk on voice chat or from inferring from their other chat (e.g., “I need to get up early for a class tomorrow”). I actively collected data in the form of text and voice chat for a one month period which I hope will illustrate some of what I have to say, but a lot of my insights come from the overall 18 month experience in the game and 6 month experience with the group. When I started collecting data, I asked for permission and asked the raid members to tell me if they were under 18 so I could exclude their chat from my analysis. Only one told me he was under 18, which supports my suspicion that most players of World of Warcraft in RP servers who get into high-end raid groups are adults. I joined the warlock channel “soulburn” at 6:09 PM. Once I joined, Lauren welcomed me into the channel. The text chat from all of my subscribed-to channels were recorded to external text files for later analysis using a third-party addon to the game. The raid group also uses third-party voice chat software, and I was able to record movies of my computer video and audio including their voice chat during certain boss fights. These recordings were done for a period of one month in the spring of 2006. I will attempt to describe two of these sessions and contrast them with each other.